In 2006, the National Institute of Mental Health Sequenced Treatment Alternatives to Relieve Depression (STAR*D) study reported the cumulative remission rate for depression was 67%, indicating that approximately one third of individuals diagnosed with depression continued to experience symptoms after multiple treatment efforts (Rush et al., 2006). Of individuals who have treatment-resistant depression (TRD), 30% attempt suicide (Bergfeld et al., 2018), which poses a substantial burden to society in terms of financial cost and loss of productivity (Amos et al., 2018). The term TRD refers to the condition in which a patient diagnosed with major depressive disorder (MDD) continues to have symptoms after up to four adequate medication and psychotherapy trials. Yet, the definition of TRD is vague. Some definitions refer to TRD as persistent negative outcomes after two trials of medication, whereas others require three or four medication trials and/or concurrent psychotherapy with medication. But does that treatment include different evidence-based psychotherapeutic strategies, such as cognitive-behavioral therapy, interpersonal psychotherapy, psychodynamic psychotherapy, electro-convulsive therapy (ECT), or repetitive transcranial magnetic stimulation strategies? The STAR*D study found that the likelihood of responding to subsequent treatments decreased with the number of failed trials (Rush et al., 2006). Predictors of depression relapse in adults include comorbid anxiety, panic, social phobia, and personality disorders; higher suicidal intention; greater severity of depressive symptoms; melancholia; number of hospitalizations; recurrent episodes; early age at onset; and nonresponse to first antidepressant medication received (Souery et al., 2007). In children, predictors of poor outcome include low levels of peer support and limited parental support (Healy & Sanders, 2017). In old age, predictors include sleep disturbance, lack of apparent sadness, and lack of ability to feel emotions (Gebara et al., 2018). Hence, how can clinicians conceptualize TRD to provide effective care for patients? Individuals with TRD experience depression as well as the demoralization of not getting better despite extreme effort. With each treatment failure is the risk of suicide. The remarkable variation in treatment response to medication and psychotherapy raises the question: Is TRD a more severe form of MDD, or is it a different type of depression altogether? Brain imaging of patients with TRD demonstrates decreased overall perfusion in the frontal cortex and right hippocampus (Amen, Taylor, Meysami, & Raji, 2018) as well as decreased amygdala activity (Ferri et al., 2017) that may account for diminished emotional responsiveness and cognitive negativity. More recently, studies have shown inflammatory markers that signal TRD including increases in tumor necrosis factor, interleukin (IL) 1β, IL-6, and the acute phase C-reactive protein (Vinberg, Weikop, Olsen, Kessing, & Miskowiak, 2016), indicating not that MDD is an inflammatory disorder but rather that inflammation affects the brain. There is increasing interest in the role of glutamate in mood disorders and inflammatory cytokines increasing glutamate metabolism (Haroon & Miller, 2017), which may account for the rapid improvement of symptoms after intravenous infusion of ketamine, a non-competitive antagonist of N-methyl-D-aspartate (NMDA). 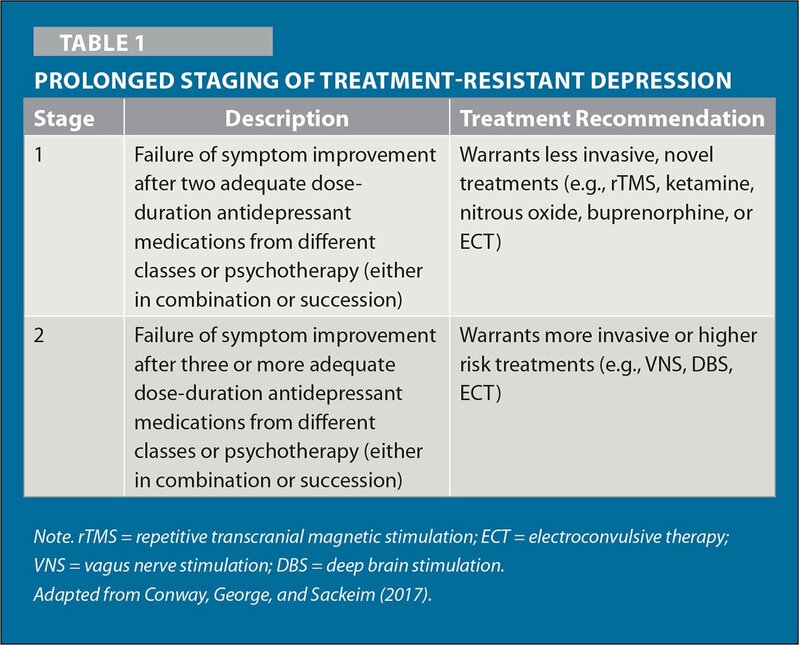 Although the STAR*D study identified the severity of TRD, subsequent studies revealed strategies for clinicians to help individuals experiencing intractable depression. Recognizing risk factors for TRD can guide clinicians in assessing clients in the initial treatment of MDD. Sleep-onset insomnia, non-restful sleep, and nocturnal awakenings (Bernert et al., 2017) as well as general restlessness, weight changes (Sakurai, Suzuki, Yoshimura, Mimura, & Uchida, 2017), prolonged period of symptoms in the first episode with comorbid physical and psychiatric disorders, lower baseline functioning (Sinyor, Schaffer, & Levitt, 2010), irritability, anxiety, panic, and overall worsening regardless of treatment (Jha, Minhajuddin, South, Rush, & Trivedi, 2017) foretell poor outcomes. Early follow-up studies of STAR*D proposed that rapid responders to antidepressant medications were more likely to recover without relapse (Icick, Millet, Curis, Bellivier, & Lépine, 2014); however, later meta-analyses found early improvement to be a poor predictor of symptom remission or later relapse (Olbert, Rasmussen, Gala, & Tupler, 2016). By considering the risk factors, clinicians can be alert to the possibility of TRD and aware that the first round of treatment must be directed at achieving maximum dosage of medication that matches the patient's presenting symptom cluster and continue with that medication for at least 6 to 8 weeks. In addition, the patient should receive some form of supportive interpersonal psychotherapy (e.g., CBT, psychodynamic therapy, mindfulness-based therapy). Due to the heterogeneity in MDD, treatment should be based on initial symptom presentation matched with medication that targets that profile (Olbert et al., 2016). If the prominent symptoms of depression include poor concentration, lack of motivation, irritability, and sleep onset disturbance, it is better to start with a serotonin norepinephrine reuptake inhibitor (SNRI), rather than the customary serotonin reuptake inhibitor (SRI), to provide greater dorsolateral prefrontal cortex activation (Bobo, 2017), as well as some behaviorally activating psychotherapy that is supportive in nature (Russo, Tirrell, Busch, & Carpenter, 2018; Sacks, Greene, Hibbard, & Overton, 2014). For more anxiety laden and panic depressive features, initial treatment with SRIs would more likely bring early relief of symptoms (Bobo, 2017). Maintaining weekly follow-up appointments until the patient achieves some symptom relief is important in providing support and encouragement and permitting assessment of worsening symptoms, especially suicidal ideation. If the patient continues to have significant depressive symptoms after an adequate trial of the first medication, the clinician needs to decide whether to switch to a different class of medication or augment with another medication from a different class. Switching to a SRI if a SNRI was initially tried is reasonable, as is switching to a norepinephrine dopamine reuptake inhibitor (i.e., bupropion) if concentration and motivation are prominent features. Multimodal serotonergic agents (i.e., vortioxetine) are effective at targeting specific serotonin receptors (e.g., 5-HT1B, 1D, 5HT7) to achieve more robust and broader symptom relief with minimal side effects and can be used with children (Strawn, 2017). Tricyclic antidepressant agents might be reasonable, especially if sleep onset and early awakening insomnia are problematic, but suicidal risk must be considered due to toxicity if taken in overdose (Bobo, 2017). The most tolerable treatment for augmentation is lamotrigine, especially if mood lability and impulsivity are part of the symptom cluster (Cowen, 2017; Papadimitropoulou, Vossen, Karabis, Donatti, & Kubitz, 2017). Alternatively, augmentation with a serotonin dopamine antagonist (SDA) with multimodal receptor activity would benefit patients who have a preponderance of ruminative thinking and emotional sensitivity (Cowen, 2017; Dold & Kasper, 2017). Quetiapine works well with patients who have difficulty with sleep onset insomnia (Papadimitropoulou et al., 2017); and the multimodal SDAs, such as aripiprazole and brexpiprazole, combined with a SRI provide rapid symptom relief (Cipriani et al., 2018; Ma et al., 2017). When suicidal ideation and risk remain, lithium is the first line augmentation, as it has the most robust data for suicide prevention (Dold & Kasper, 2017; Pruckner & Holthoff-Detto, 2017; Zivanovic, 2017). With each medication change, there needs to be an adequate time trial at the therapeutic dosage before further changes are made. Other augmentation strategies have been considered with less successful results based on randomized clinical trials (RCTs), but may have pragmatic benefit with some patients. For example, augmentation with triiodothyronine (T3) has modest effectiveness in improving symptoms; however, some long-term RCTs have small sample sizes and flawed designs (Parmentier & Sienaert, 2018; Russo et al., 2018). Using T3 requires careful monitoring of hormone blood levels and is most effective when combined with a SNRI (Touma, Zoucha, & Scarff, 2017). When there is modest improvement in energy and motivation, it is helpful to obtain a serum B-12 and folate level for consideration of augmentation with antidepressant medications to improve symptoms (Mathew & Lijffijt, 2017). After lack of significant improvement with at least two medications in combination with psychotherapy and/or intensive suicidal risk, more aggressive treatment approaches should be considered. ECT has a long and impressive record in treating mood disorders, especially TRD (Bayes & Parker, 2018; Cakir & Caglar, 2017; Ross, Zivin, & Maixner, 2018). With current administration strategies, cognitive and memory side effects are minimal, and the reduction of suicidal risk is beneficial, with remission of depression likely within 1 year (Cakir & Caglar, 2017). More recent adaptation to ECT is magnetic seizure therapy (MST), which showed similar efficacy to right unilateral ECT without cognitive side effects in a pilot study (Fitzgerald et al., 2018); however, the sample was small, and the study requires replication. Repetitive transcranial magnetic stimulation (rTMS) is a simpler treatment with minimal side effects or risk profile and shows effectiveness across all adult age groups (Myczkowski et al., 2018; Russo et al., 2018). Effectiveness of rTMS is less likely with individuals who are highly agitated and have longer duration of illness; however, somatic anxiety, sleep disorders, and health worries were positive predictors of effective response (Poleszcyk, Rakowicz, Parnowski, Antczak, & Swiecicki, 2018). Vagus nerve stimulation and deep brain stimulation (still under investigation) have shown improvement in TRD when other methods have failed; however, additional study is necessary (Bergfeld et al., 2018). Ketamine, a non-competitive antagonist of the NMDA receptor for glutamate, is a more recent innovative approach to TRD. More detailed discussion of ketamine treatment will be featured in the next column. Ketamine has been available as an anesthetic and analgesic for decades, and recently, subanesthetic dosages have been demonstrated to produce immediate remission of depression and suicidal ideation with a duration of up to 72 hours after a single infusion (Mathew et al., 2012; Rybakowski, Permoda-Osip, & Bartkowska-Sniatkowska, 2017). This is off-label use of ketamine because it is given in much lower dosages (0.4 mg/kg to 0.8 mg/kg) than indicated for anesthesia and currently requires administration by a physician in the United States. The American Psychiatric Association consensus guidelines recommend administration by intravenous infusion at doses of 0.4 mg/kg to 0.8 mg/kg over a period of 30 to 40 minutes with cardiovascular monitoring for hypertension, hypotension, bradycardia, or tachycardia (Sanacora et al., 2017). The usual course of treatment is twice per week for 3 weeks. Additional side effects include dissociation and psychosis (Sanacora et al., 2017). As a preemptive approach to TRD, Conway, George, and Sackeim (2017) proposed staging MDD similar to staging of cancer diagnosis as noted in Table 1. The authors caution that failed treatment requires a thorough review of medical records to assure adequate dosage and duration of medication trials, and failed psychotherapy includes adequate course of attended sessions (Conway et al., 2017). TRD requires a more thoughtful approach to treatment because of the difficulty in achieving remission of symptoms and the suffering and suicidal risk it presents for patients. Clinicians need to carefully assess patients at the initial presentation and review the medical and psychiatric history for predictive indicators of TRD. If those predictors are present, clinicians can develop a treatment plan that includes concurrent pharmacological and psychotherapeutic treatments with full dosage and duration. Table 2 provides a summary of strategies to consider in that treatment plan. Bobo, W.S. (2017). Treatment of depression. In Schatzbert, A.N. & Nemeroff, C.B. (Eds. ), Textbook of psychopharmacology (5th ed.). Washington, DC: American Psychiatric Association Publishing. Touma, K., Zoucha, A.M. & Scarff, J.R. (2017). Liothyronine for depression: A review and guidance for safety monitoring. Innovations in Clinical Neuroscience, 14(3–4), 24–29.